Can your water pump withstand the Australian climate? 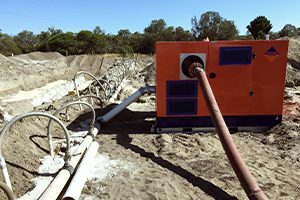 AllightSykes’ range of off-the-shelf pump products is giving construction companies a water pumping solution that’s built to withstand the challenging Australian climate. For construction equipment specialists AllightSykes, more often than not, contractors will want a de-watering system that can keep up with the changing demands on site, but are also very quiet. To install soak wells and build retaining walls, an AllightSykes client created a wellpoint system over 50 metres long, with nearly 50 individual spears driven at least 6 metres into the ground – all within close proximity to residential homes. With locals living just metres away from earthworks, a pumping solution that minimised noise was paramount, and the client reached out to AllightSykes and another pump supplier for a competitive test – or trial – of equipment. For this particular job, AllightSykes recommended a pump with acoustic covering from its Contractors Range – the heavy-duty QSWD150i low head model. With no issues in the de-watering process and positive experiences allround, the contractor ultimately opted for AllightSykes’ pump solution. For nearly 60 years, AllightSykes’ pump range has been the backbone of its business, providing Australian contractors with a comprehensive suite of Sykes pumps to suit the variable demands on civil worksites. “Sine 1967, the company has built up from a small rental industry and evolved to encompass the construction sector and the wider industrial market,” Gert Inja, AllightSykes Product Lifecycle Manager – Pumps, explains. As designer and manufacturer of its diverse pump range, the business has an in-depth knowledge and understanding of the market and technical de-watering requirements in the construction industry. The Australian OEM has its own engineering design, sales and product support team, which enables the products to be designed, assembled, manufactured and tested in Australia in accordance with ISO 9001 Quality System and ISO 9906 Rotodynamic Pumps Hydraulic performance acceptance test Grades 2 to meet even the harshest environments in the country. Mr. Inja says the business has made a concerted effort to update its range of high-quality standard products in the past three years, so they can provide the everyday contractor with an off-the-shelf solution that suits all their needs. “Within the construction sector, the pumps will work in what is called ‘puddle jumping’ applications, helping pump water from one puddle to a holding tank elsewhere, or for use by water trucks and to de-water a site,” he says. “To meet market demand for a simple robust automatic self-priming pump unit, we developed the base and standard range of pumps. It is everything you expect from a standard Sykes pumps: reliability, toughness, durability, solids-handling capability, automatic self priming and excellent pump efficiency and performance. “We offer monitoring applications as well – the can user stop/start the pumps via text with a phone and can connect to the pressure gauge or flow meter remotely,” Mr. Inja explains. Combined with easy fit, repair and maintenance, the ability to monitor the pumps remotely makes them an asset on site, especially when dealing with the harsh and demanding local climate. To compete in Australian conditions, the pumps are heavy duty designed and manufactured as standard with multi-spring balanced mechanical seal assembly. Hardwearing and suitable in most fluid and high-temperature applications, the range has pre-set spring tension, resulting in correct mechanical seal working length on the mechanical seal faces. The heavy-duty air compressor on the pumps also has a large variable speed range, making it a flexible set-up that complements the pump range. “The air compressor is rated to operate 24/7 and will re-prime the pump if the pump loses its prime, i.e. dam or pond water level drops,” Mr. Inja explains. The robust non-return valve assembly also allows priming of the system by effectively sealing the pump discharge pipework, which prevents pump discharge pipe fluid to enter the pump after the pump has stopped operation. While its external features make it a hardwearing solution for Australian conditions, Mr. Inja asserts the pump internals are one of the main standout features of AllightSykes’ pumps. AllightSykes pumps are built with stainless steel 316 internals (front, rear wear plates and impeller) as standard, which is an austenitic stainless steel used extensively in the marine industry. “This is because it has excellent corrosion resistance for the majority of general pump fluids application where these pumps get utilised,” Mr. Inja says. “Our research and extensive industry experience indicates that in the majority of pump applications the pump internal normally corrodes before eroding.